Additional Info: Libya has recently been inaccessible to travelers, which sometimes makes it more appealing. 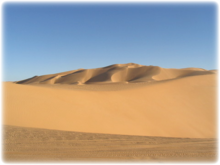 It is a land of beautiful barren deserts and impressive ancient monuments. The area known in modern times as Libya was later occupied by a series of peoples, with the Phoenicians, Carthaginians, Greeks, Romans, Vandals and Byzantines ruling all or part of the area. Although the Greeks and Romans left ruins at Cyrene, Leptis Magna and Sabratha, little other evidence remains of these ancient cultures. A guided tour of the country is perhaps most recommended unless you know people in the country who can show you around. Tripoli is the capital city of Libya and is located in the northwest of the country on the edge of the desert, on a point of rocky land projecting into the Mediterranean Sea and forming a bay. Tripoli was founded in the 7th century BCE by the Phoenicians, who named it Oea. » The city's old town is still unspoiled by mass-tourism, though it is increasingly being exposed to more and more visitors from abroad, following the lifting of the UN embargo in 2003. However, the walled medina retains much of its serene old-world ambiance. » The Assaraya al-Hamra (the Red Castle), a vast palace complex with numerous courtyards, dominates the city skyline and is located on the outskirts of the medina. There are some classical statues and fountains from the Ottoman period scattered around the castle. » The Gurgi and Karamanli mosques, with their intricate decorations and tile work, are examples of the artistic skills of local craftsmen. Just outside the Gurgi mosque is the Arch of Marcus Aurelius, the only surviving Roman monument in the city. More and more palaces (especially from the Karamanli period) are also being restored and opened to the public. Ghadames is an oasis town in the west of Libya. 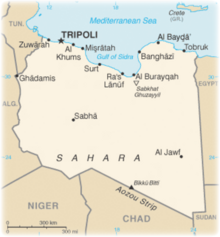 It is located approximately 340 miles the southwest of Tripoli, near the borders to Algeria and Tunisia. The old part of the town, which is surrounded by a wall, has been declared World Heritage of the UNESCO. Cyrene, in the eastern coastal region, was founded in the 7th century BCE and under different influences, from the Carthaginians, Greeks, Egyptians and then Roman. The site at Cyrene has yet not been fully excavated but some remarkable finds from the Greco-Roman period can be seen; Cyrene ranks as the best-preserved of the Greek cities of Cyrenaica, with its temples, tombs, agora, gymnasium and theatre originally modeled on those at Delphi. Its location high on a bluff overlooking the sea is stunning.